07/30/15 - Syndicated food columnist Linda Gassenheimer, Special wine correspondent Fred Tasker and WLRN hosts Joseph Cooper and Bonnie Berman interview Bill Talbert, President and CEO Greater Miami Convention and Business Bureau and Ralph Pagano Chef/Owner Naked Taco and Naked Lunch. Bill will give us tips on how to navigate the offering for this year’s Miami Spice – August and September. Ralph will talk about the Iron Fork Kick-Off event for Miami Spice. He is one of the judges for the cooking contest there. The event will raise funds for Share our Strength. 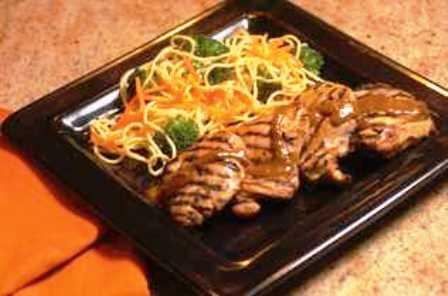 Savor the flavors of Korea with this grilled chicken coated with a garlicky soy sauce glaze. This is one of the treats you can find from a street vender Seoul, Korea where the aromas from the food stalls fill the air. I use chicken thighs for this quick meal. They’re juicy and meaty and you can find boneless, skinless thighs in the market. The chicken dish can be grilled outside, cooked on a stove-top grill or sauteed in a skillet. Sesame oil, rice vinegar and low-sodium soy sauce are used in this dinner. I like to keep them on hand to add Asian flavors to many meat, rice or vegetables dishes. Place chicken thighs in a plastic bag. Add soy sauce, vinegar, garlic, sesame oil, mustard, ginger and black pepper. Seal the bag and gently shake to combine ingredients. Marinate about 5 minutes while making side dish. Remove chicken from bag and pour marinade into a sauce pan. Place chicken on grill about 6 inches from heat. Cook 5 minutes, turn, cook 3 minutes. A meat thermometer should read 180 degrees. While chicken grills, bring marinade to a boil and cook until it thickens, about 1 to 2 minutes. Spoon over chicken. Makes 2 servings. Bring a large saucepan filled with water to a boil. Add the noodles, broccoli florets and shredded carrots. Boil 2 minutes. Drain and toss with the sesame oil and salt and pepper to taste. Makes 2 servings. To buy: 3/4 pound boneless, skinless chicken thighs, 1 bottle low-sodium soy sauce, 1 small bottle rice vinegar, 1 bottle sesame oil, 1 small package steamed or dry Chinese noodles, 1 small container ground ginger, 1 small package broccoli florets and 1 package shredded carrots. Staples: Garlic, Dijon mustard, minced garlic, salt and black peppercorns. If using a stove-top grill or skillet, spray with vegetable oil spray before adding the chicken. Boneless chicken tenderloins can be used instead of thighs. Steamed Chinese noodles can be found in the produce section of the market. Dry Chinese noodles or angel hair pasta can be used.